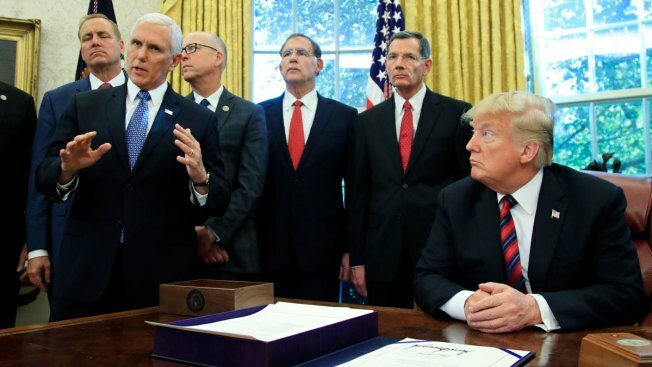 President Donald Trump listens to Vice President Mike Pence following a ceremony signing the "America's Water Infrastructure Act of 2018" into law in the Oval Office at the White House in Washington, Tuesday, Oct. 23, 2018. Vice President Mike Pence misstated federal statistics Tuesday when trying to help President Donald Trump make the case that terrorists are among thousands of migrants moving through Mexico toward the U.S. border. Trump himself acknowledged he's got no proof terrorists are in the mix. PENCE: "In the last fiscal year, we apprehended more than 10 terrorists or suspected terrorists per day at our southern border from countries that are referred to in the lexicon as other than Mexico. That means from the Middle East region." — remarks at a Washington Post event. THE FACTS: He misused information from the government. Election Day is just two weeks away, and President Donald Trump is doing all he can to get Republicans to the polls. 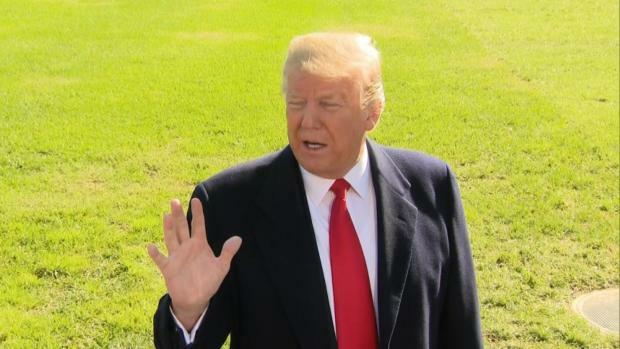 The migrant caravan making its way through Mexico is another popular focus for Trump, who claims "MS-13" and "Middle Easterners" are among those heading toward the United States. U.S. Customs and Border Protection arrested an average of 10 people a day in the 2017 budget year who were trying to enter the U.S. from countries with suspected links to terrorism, according to Pence's office. That average applies to all points of entry, not just the southern border. And the primary points of entry for people coming from overseas are airports, not the two borders. Pence's office acknowledged his mistake. Pence cited the information accurately later, at an Oval Office bill signing by Trump. 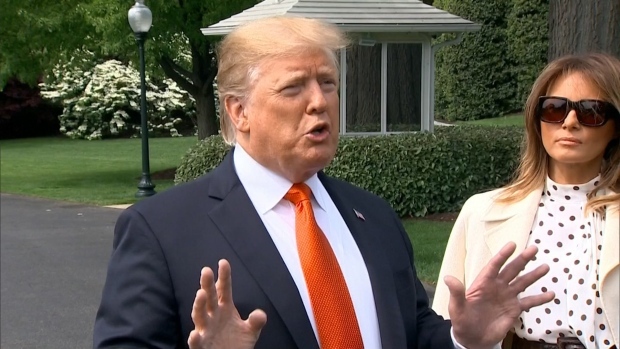 TRUMP: "I spoke with Border Patrol this morning. ... They say that over the course of the year, over the course of many years, they have intercepted good and bad people, including people from the Middle East. There's no proof of anything." — remarks at Oval Office bill signing. THE FACTS: He is correct that no information has been made public to support his previous claim that Middle Easterners, apparent code for Islamic extremists, have infiltrated the migrant caravan to reach the U.S. White House press secretary Sarah Huckabee Sanders had claimed there was evidence to back up his tweet. The migrants participating in this caravan are mostly from Honduras, where it started, as well as El Salvador and Guatemala. On the whole they are poor, carrying the belongings that fit into a knapsack and fleeing gang violence or poverty. Given the sheer number of migrants, it's possible some are criminals — as Trump has also asserted. Some migrants clashed with Mexican police at the Mexico-Guatemala border, hurling stones and other objects as they tried to cross the international bridge. Caravan leaders said they had expelled some troublemakers from the procession, exhibiting some self-policing. Ultimately, most entered Guatemala — and later, Mexico — by illegally bypassing immigration checkpoints. The caravan otherwise has been overwhelmingly peaceful, receiving applause and donated food from residents of the towns they pass. Mexican police have not tried again to stop them. Guatemalan officials say they detained several Syrian citizens with false documents two years ago and deported them. No evidence was made public connecting them to the Islamic State group. Trump now says: "There's no proof of anything. But there could very well be."